Be able to use the new strategic map for HRM. Develop your skills for the future and be able to help transform any people activity into and added value activity. Transform recruitment and appraisal processes with startling results. Ability to see added value results from HR. See a more business approach to people related activities. See improvements to business processes at no extra cost. Master the key areas of performance in HR. Be able to apply structured interviewing techniques. Improve on any performance management system. Together with your fellow participants you bring a wide variety of experience and resources to the program. The course facilitator’s role is to help you learn for yourself and to assist you as you make sense of new and very different changes in HR. Extensive use of case studies, group exercises and discussion will all contribute to your enjoyable learning experience. How to make things happen – use of business action plan. The difference between HRM and Personnel Management. The new shape and function of tomorrows HR departments. 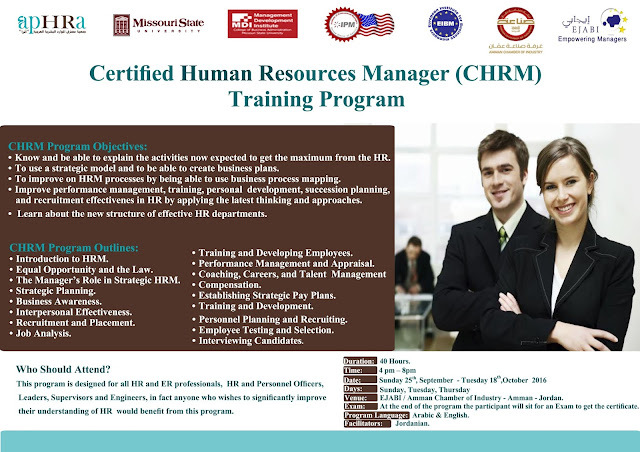 Distinction between the role of HR and the line Manager. Handling common performance problems – case studies. Handling grievances – case studies. Assessment Centres – examples of exercises. The role of HR v the role of the Line Manager. Making performance management a positive influence. Is forced ranking a good idea? Internal and external reporting frameworks. This program is designed for all HR and ER professionals, HR and Personnel Officers, leaders, supervisors and engineers, in fact anyone who wishes to significantly improve their understanding of HR would benefit from this seminar. Exam: At the end of the program the participant will sit for an Exam to get the certificate. Program Language: Arabic & English. Venue: EJABI / Amman Chamber of Commerce. Fees (Cover Trainer Fees, Training Materials, Exam, Training Certificate, Coffer Breaks): 900 JDs. © All Rights Reserved. Kilani Consulting 2018. Powered by Blogger. Kilani Consulting is a specialized Human Resources & Business Management Consulting. It provides consultancy services locally and to the Middle East to different industries. Covering all fields of Human Resources Consultancy, Recruitment Consultancy services, Business Management Consulting, Training & Development skills. To be one of the most spread consultancy companies in the Middle East that shares the success and development of achieving Clients’ ambitions and objectives. To carry out the tasks on a highly competent and professional level, and deliver consultancy services as Clients’ require.